If you had told me a few years ago that there would be fine dining at the Navy Yard, I would have scoffed at you. Not because I don’t think that it’s a place in the city with great potential, because it actually has unlimited potential to be a destination spot for visitors and residents. But to me, the Navy Yard was where my husband used to work. On a ship. Which sat in the water. Sure, people work there, but the height of dining at the Navy Yard was going to the cafeteria at Urban Outfitters, or the occasional food truck day here and there. Then the new buildings came and the pharmaceutical companies followed. Then came the hotel. And now here we are, a Navy Yard that has a Marc Vetri restaurant. 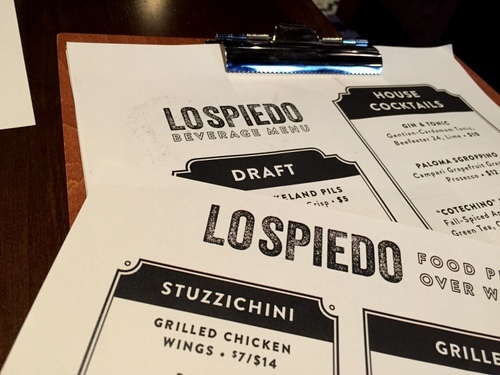 I’d been wanting to go to Lo Spiedo for awhile, but I couldn’t conceive of dragging the husband there. So when M asked to go out to dinner on a random weeknight, I suggested it on a whim. Funny thing is, she was thinking the same thing. So we hopped in the car and headed down good ‘ol Broad St. For those of you unfamiliar with the Navy Yard, Lo Spiedo is right where the front entrance is, just on the left. There is a little parking lot, but also plenty of parking on the street. It was truly bizarre going into the Navy Yard, after hours, without needing special employee access. It was fairly early, and because it was an impromptu decision, we didn’t have a reservation. The place was fairly packed though, with a heavy happy hour crowd from the companies next door, but we luckily got a table. 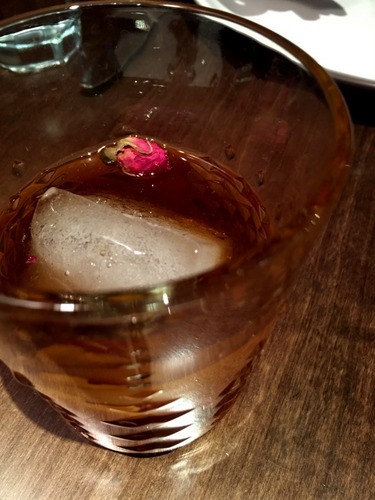 M ordered the Geisha cocktail, a freakishly strong mix of La Colombe Different Drum Rum, orange, and an actual little rose. I would have been passed out on the floor if I drank one of these. I had a house-made ginger beer which was tart yet delightful. I am fairly terrible when it comes to ordering food. Too many choices clouds my decisions. So one of my favorite things to do is ask our server for their favorites and their recommendations. 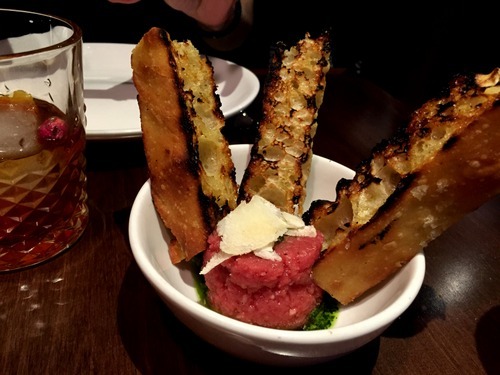 This beef tartare with bagnetto verde was not one of her recommendations, but was the only thing that we ordered that wasn’t on her list. The idea of raw beef isn’t necessarily something that would have appealed to me in the past, but after going to Korea last year and eating some amazing raw sliced beef, now I’m totally up for trying some rawness. This was good, but not particularly exciting or interesting, so it’s not something I’d have to try again. This spot is a small plates restaurant, so we ended up getting a bunch of things and sharing, just the way I prefer to eat, where I get to try a lot of different things. 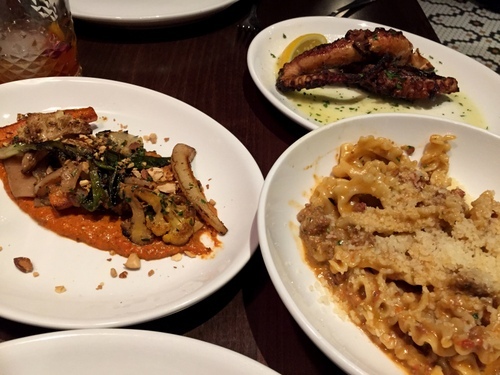 So all of these items were recommended by our adorable tattooed server: the spit-roasted vegetables with romesco and sicilian olive oil, the spit-roasted octopus, and the rignette pasta with macellaio bolognese. Man, that girl knows what she’s talking about. I don’t think I’ve ever had anything with romesco sauce before, but damn, I loved it. It was savory and sweet at the same time and a perfect accompaniment for the roasted veggies. The octopus was perfectly cooked and didn’t need any flavoring at all. It was like a really well-cooked steak, meaty and substantive, really quite great. Those two dishes were actually cooked on the spit, as per the name of the restaurant, which means the spit. But my favorite dish of the night was the rignette pasta. I don’t know what rignette is, but it’s long and squiggly edged pasta, chewy, with plenty of surface area for whatever delicious sauce its cooked with, and this bolognese was really awesome. To me, truly a perfect dish on all levels. I cleaned the plate and could have eaten more. Overall, a great meal with a great friend. I’m excited to come back and try other dishes on the menu. Looks like I’ll be back at the Navy Yard some more!